Ron’s Auto and RV Service Center has been serving the Vancouver metropolitan area since 1976. 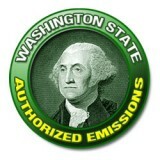 We are an authorized Washington state emissions repair shop. If your vehicle has recently failed DEQ emissions in Washington, we can help you pass your emissions test. Our shop works on all makes and models of vehicles, including foreign and domestic and we provide diagnosis and repair services for all vehicle’s emissions testing needs. Due to the fact that motor vehicles are the number one air polluter in Washington State. The Department of Environmental Quality (DEQ) is responsible for testing vehicles to ensure they are not emitting excess air pollution. Making the necessary repairs to pass a Washington State emissions test can be very costly. If you have failed an emissions test you are only required to spend a minimum of $150.00 on diagnosis/repairs. We are an authorized emissions repair shop and will make sure you qualify for an emissions waiver if needed. Anyone can repair your vehicle. However, repair costs will only apply toward a waiver when an Authorized Emission Specialist (AES) performs the repairs. When do I need a DEQ Emissions test for my vehicle? Typically, DEQ emissions testing is required when renewing tags for a vehicle, or when a vehicle moves into the state from a different area. Vehicles between five and twenty-five years old require testing every other year. A test is also required to transfer the registered ownership between private parties for 1989 through 2008 model year vehicles unless the vehicle has been tested within the last 365 days. However, emissions testing is not required to transfer the registered ownership between parents, siblings, grandparents, grandchildren, spouses, legal domestic partners, or present co-owners or to change the legal owner. Motorcycles, 2009 and newer models, Toyota Prius and Honda Insight never need emissions testing. How much does the DEQ Emissions test cost? Typically, the DEQ emissions test costs $15 with a free retest if performed within one year of the initial test. My vehicle failed the DEQ Emissions test in Washington State. What should I do? If you have recently failed the DEQ emissions test in Washington, you should have received a print out of your vehicle’s test results. Based on these results, and in addition to a thorough inspection performed by one of our highly trained technicians, we can repair or re-install the parts necessary for your vehicle to ensure you pass the DEQ emissions test the second time.